It’s a diver’s paradise. From above, the Blue Hole of Belize is astonishingly beautiful, a sapphire pool contrasting with the warm turquoise waters of the Caribbean Sea surrounding it. And as one gets closer to its edge, the sheer immensity of its drop into the abyss becomes that much more apparent. A team of scientists and conservationists, led by business mogul Sir Richard Branson and Jacques Cousteau’s explorer grandson Fabien Cousteau, sought out to fully explore its depths and properly map them for the first time. But what they would discover at its bottom would leave them horrified. 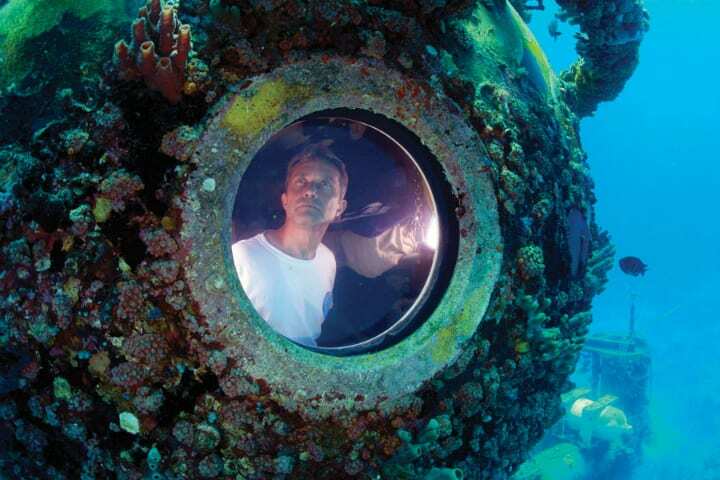 Fabien Cousteau is a world-renowned deep-sea explorer with a passion for ocean conservation. From scoping out underwater Civil War shipwrecks to swimming with and documenting sharks up close and personal on multiple occasions, he’s done it all. One recent mission in particular, however, bore a special personal resonance for him — and defied expectations. In 2018, he set sail for the west coast of the Caribbean Sea, in the tropical Central American nation of Belize. He was intent on exploring the fabled Blue Hole, the largest oceanic sinkhole in the world — and its dangerous depths. What he would find would leave the scientific world aghast. The Belize Barrier Reef, which lies just off the shores of the Central American nation, comprises a vast chunk of what is called the Mesoamerican Barrier Reef System. It stretches from Mexico’s Yucatán Peninsula southward to Honduras, making up the second largest such reef network on the planet, following the Great Barrier Reef in Australia. While sailing through the region in 1842, famed naturalist Charles Darwin himself gushed that it was “the most remarkable reef in the West Indies.” The Blue Hole stands gaping at the reef’s center, its deep indigo waters standing out sharply from the shallows of the reef surrounding it. And upon first glance, it becomes clear Darwin did not exaggerate. 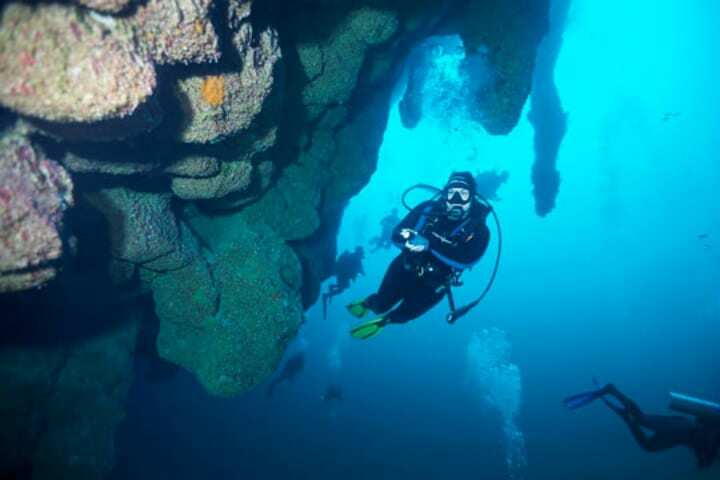 At the center of Lighthouse Reef in the easternmost part of the Belize Barrier Reef, the Blue Hole is a natural Mecca for scuba divers, ever curious to figure out just what exactly IS down there at the bottom of the 420-foot drop. But it’s far from without its perils: divers must complete at least 24 dives before taking the plunge. This enormous yawning underwater sinkhole is cavernous enough to hold two Boeing 747 planes, with room leftover. Peering into the darkness of its depths leaves the observer burning with curiosity. With such a daunting dropoff into the murky unknown, the question all who have set eyes on the Blue Hole ask is: what mysteries and monsters could lurk beneath? For Fabien Cousteau, this mission held special personal resonance. His grandfather was Jacques Cousteau, the world-famous French oceanographer who had become the most famous and well-beloved deep sea explorer. 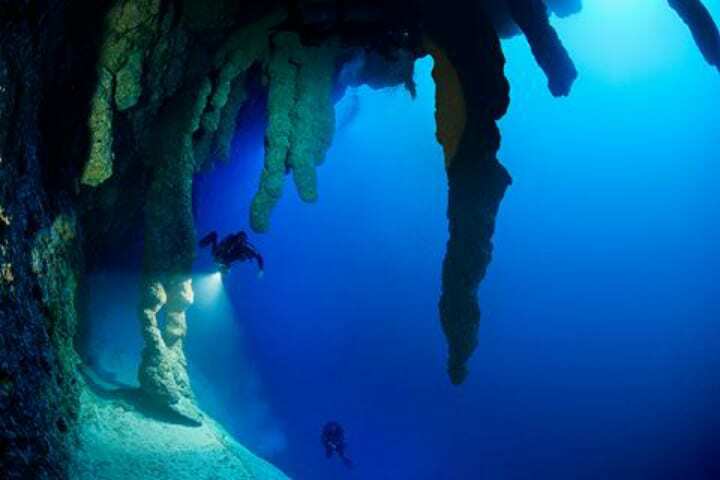 Jacques had come to the Blue Hole in 1971, declaring it to be one of the top five diving spots on Earth. But the equipment he had used was not as sophisticated as the tools that his grandson now possessed, and he had only gone for a brief peek. Now, it was time to more thoroughly map and explore its depths. And Fabien had another legendary figure at his side on the mission. 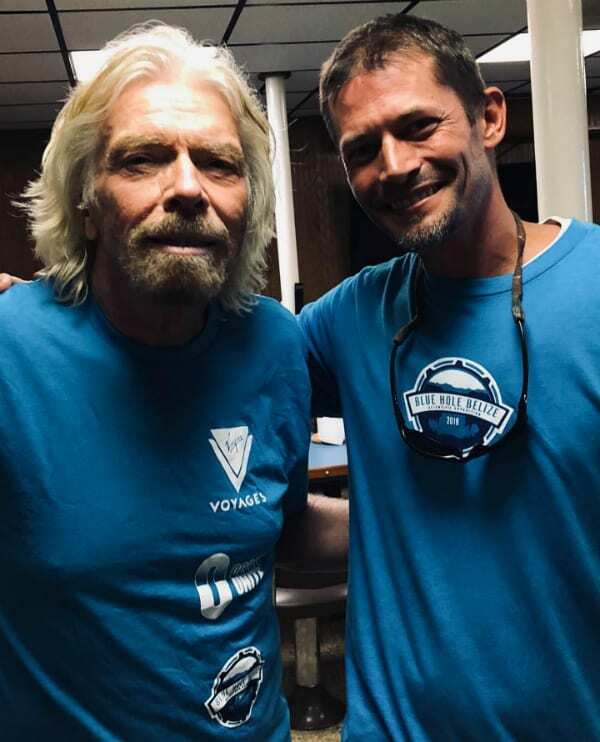 Joining Fabien Cousteau on his expedition to the Blue Hole of Belize was none other than iconic English business mogul and conservationist Sir Richard Branson. 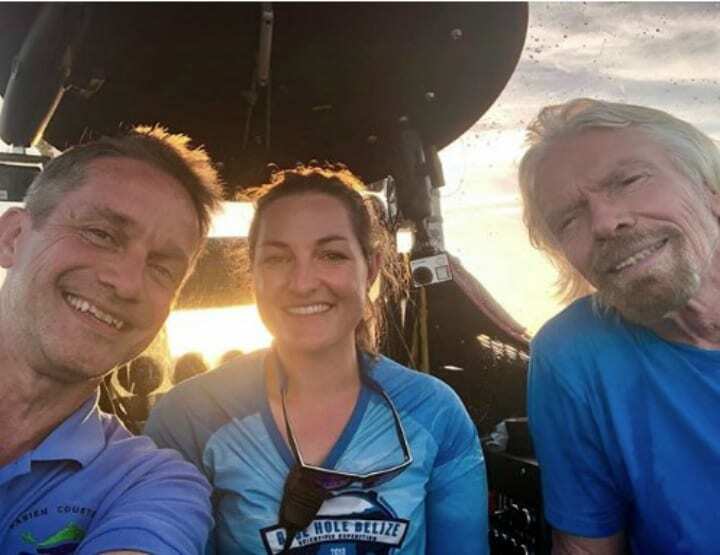 The Virgin Group tycoon was keen on spearheading the fact-finding mission to the bottom of the Blue Hole and to thoroughly explore its depths himself in the team’s submersible. 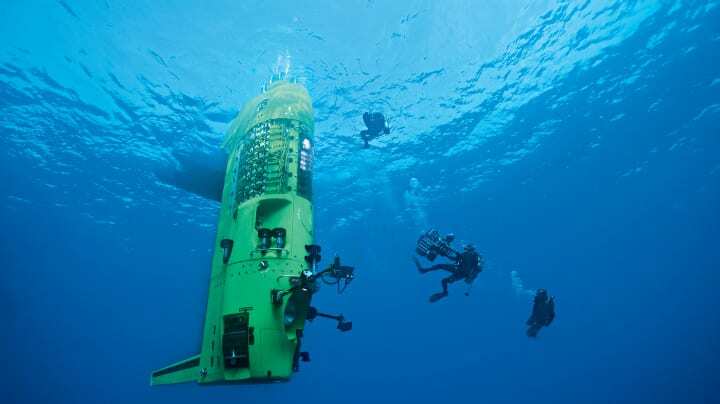 Together with their main pilot, oceanographer Erika Bergman, Sir Richard and Cousteau prepared to make the voyage in their trusty vehicle, the Aquatica submarine. Everyone was excited to learn more about the nature of the Blue Hole. They had no clue what would be waiting for them, lurking down in the gloom of the deep. Sir Richard Branson is known for using his position as a billionaire and public figure to promote awareness of climate change and ways to help combat it by creating a more sustainable planet for future generations. He has even hosted a summit on global warming at his own private residence in the British Virgin Islands. Back in 2006, the magnate made the announcement that he would specifically allocate the profits from his airline and train empire towards fighting global warming. It was a colossal sum, estimated to be around $3 billion. It was his passion for the environment that had brought him to the Aquatica submarine mission to the bottom of the Blue Hole off the coast of Belize. 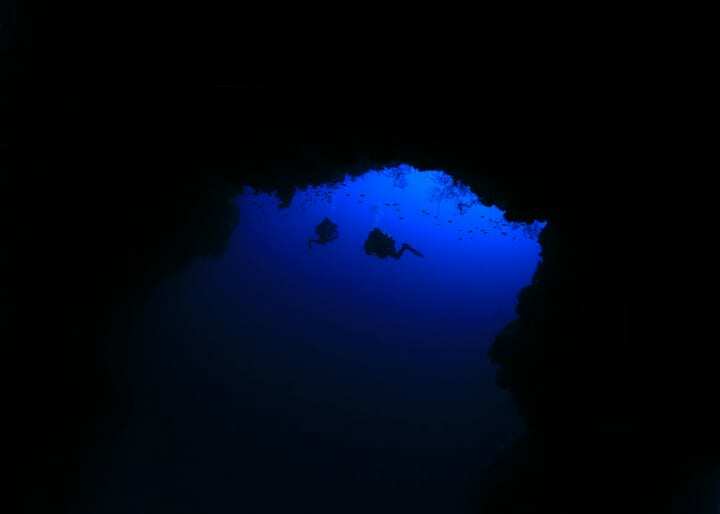 The mission into the Blue Hole of Belize was unlike any prior expedition. This was to be the deepest venture any scientific team had made into the sinkhole before, and while it was by no means the deepest point in the area, nor the world’s deepest aquatic sinkhole, its unexplored interior left tantalizing questions about its geological and biological history. Sir Richard Branson had dubbed the mission as “planetary inner space.” The high profile of the participants in the mission only increased the intrigue surrounding it. Their descent into the Blue Hole would be live-streamed across the world on the Discovery Channel. Cameras rolling, the submarine sped along. The excitement was palpable. Not since Titanic director James Cameron plunged into the Mariana Trench had an underwater expedition attracted so much coverage and excitement, boosted no doubt by the celebrity of the submersible’s acclaimed passengers. The Aquatica submarine had an enormous dome over the top, affording those inside views overhead, to their side, in front, and behind. After descending for roughly 10 minutes in the submarine, the team of underwater explorers began to skirt the walls of the Blue Hole. 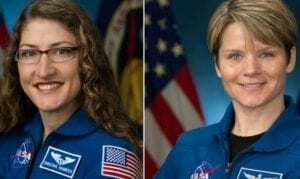 The images broadcast from their voyage showed what looked almost like the side of a crater that had been created from the impact of a celestial body. But, as they were about to see up close, the Blue Hole had been created by totally different forces. 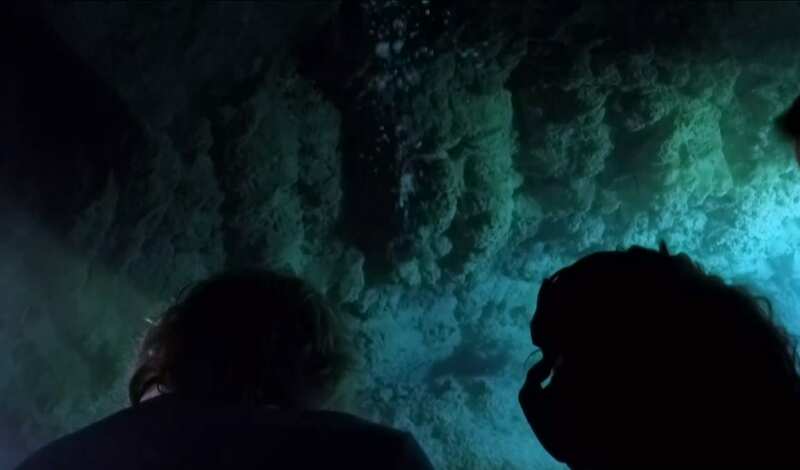 The visibility underwater began to dissipate as the submersible headed toward the bottom of the Blue Hole, but quickly enough the formation revealed to them a clear testimony to the geological processes that had shaped it. The Aquatica shone light through the falling sediment, illuminating an entire complex of hanging cave stalactites. The presences of these dangling formations could only be possible in a structure that had once upon a time been situated on dry land and created through the dripping of water into a cave. So how had this cave structure, some 43 miles east of any dry land, ended up submerged beneath over 400 feet of ocean? For Sir Richard Branson, seeing cave stalactites underwater was, in his words, “One of the starkest reminders of the danger of climate change” that he had ever seen. The reason for this had come in the aftermath of a massive ice melt at the end of the last major Ice Age. Sea levels in the Caribbean had risen so dramatically that they swamped vast swaths of land. At 300 feet beneath the surface, Branson noticed the shift in the coloring and variation of the formation, clearly demarcating what rock had been formed underwater and what rock above land. The repercussions of these forces had not remained underwater. 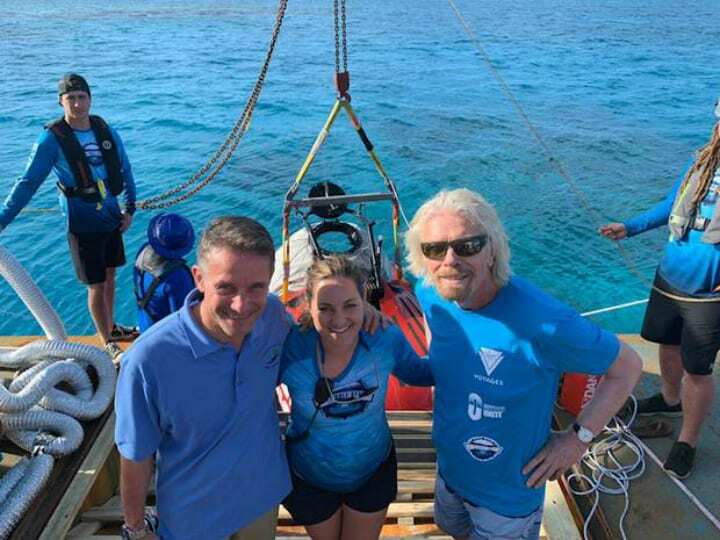 Several years before Sir Richard Branson, Erika Bergman, and Fabien Cousteau took the plunge into the waters of the Blue Hole of Belize, a team of researchers arrived to the area from Louisiana State University and Rice University. They had an entirely different mission — to document the chemical composition of its walls. 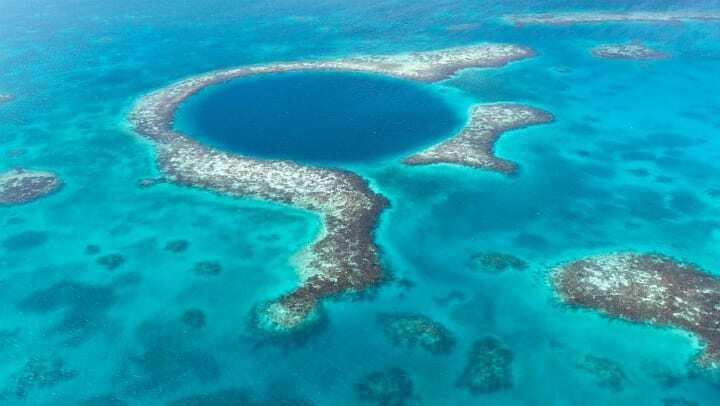 The team wanted to understand if there was a correlation between the Blue Hole and the decline of a civilization on land in Belize. They scooped up samples of sediment from the Blue Hole, which could be dated back to between 800 and 1000 CE. What they found could potentially answer one of history’s greatest mysteries. The original inhabitants of Belize, as well as the surrounding countries, had been the Maya civilization. Archaeologists, historians, and scientists alike have been baffled as to why the Maya suddenly began en masse to abandon the cities they had built. Their empire inexplicably fell apart — and the answer could have been in the Blue Hole. The samples from the Blue Hole sediment showed abnormally low levels of titanium and aluminum, elements usually worn out of rock and into the water by tropical storms. This meant the period of the Maya decline had likely been marked by a terrible drought. But what was at the bottom of the Blue Hole would mark a far more modern calamity. 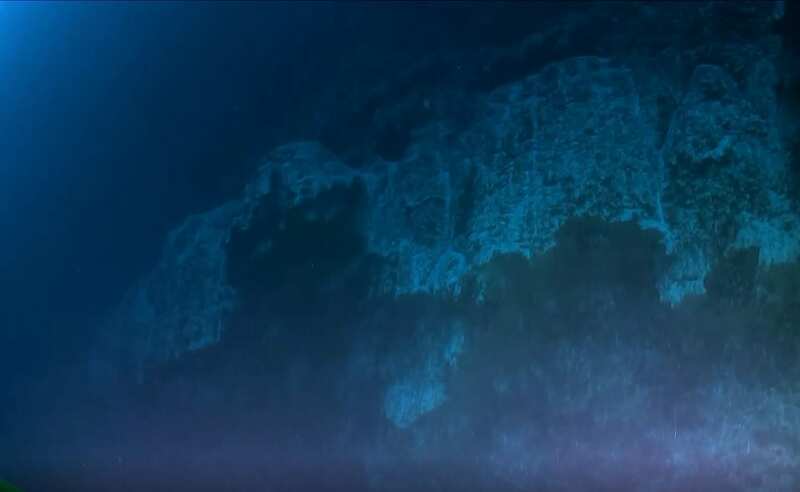 Close to the bottom of the Blue Hole, Fabien Cousteau and the team ran into something no creature ought to have been able to survive: a deadly layer of hydrogen sulfide, 20 feet thick. This was the perfect space to test out one of the submersible’s state-of-the-art technologies before they reached their final goal. They measured the oxygen levels and discerned the water’s quality. Beneath the hydrogen sulfide were the carcasses of many crabs, conches, and other organisms that had slammed into the wall of hydrogen sulfide, become mired in it, and ran out of oxygen. But there was something far more horrifying up ahead. 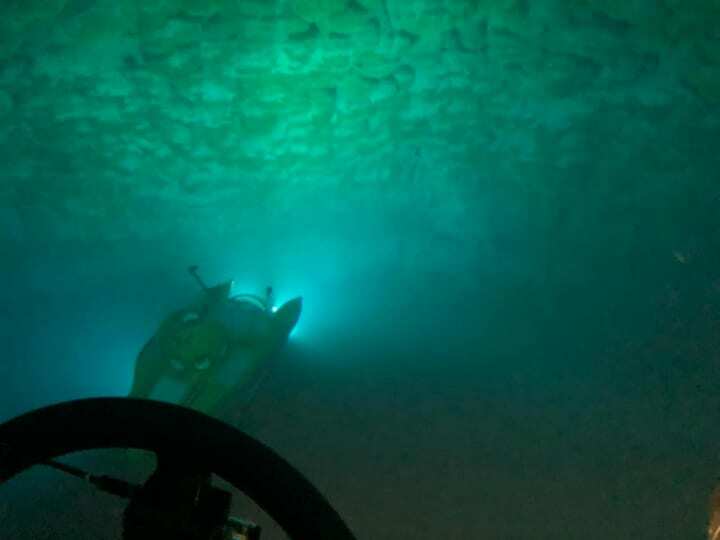 Finally, after passing through the mire of the hydrogen sulfide sheet, the research team’s submarine managed to reach the bottom of the Blue Hole. 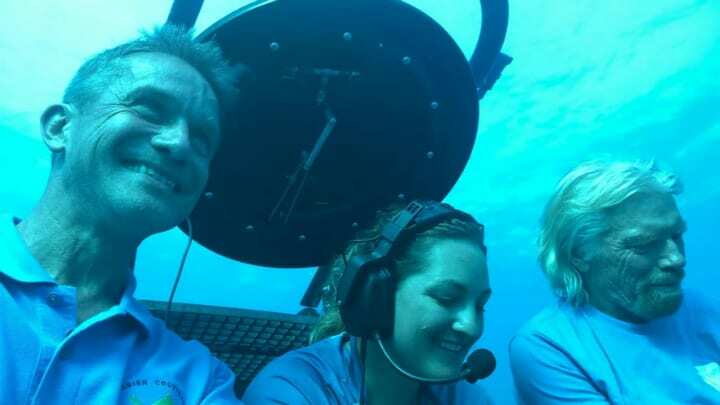 For Fabien Cousteau it was especially thrilling, as he was about to be able to expand upon the work his grandfather had started almost half a century before. All aboard were eager to see what the bottom of the hole looked like. They would finally be able to properly map the expanses of this massive geological anomaly. 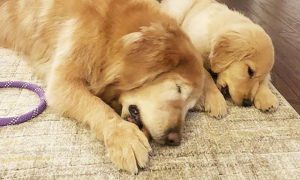 Although it was clear to them that nothing would be able to survive the hydrogen sulfite blanket, they were about to discover something that’d leave them in dismay. 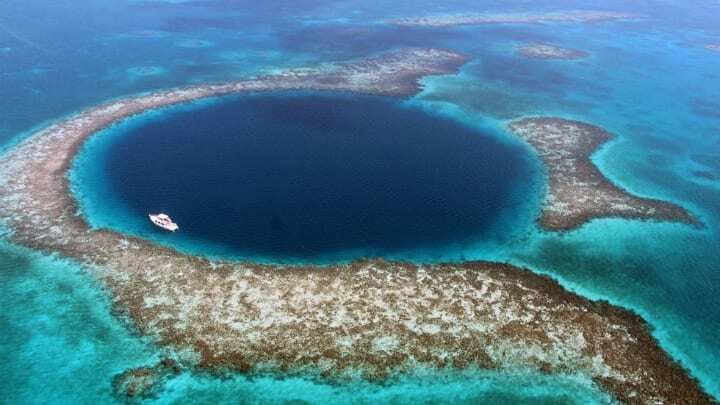 As they mapped out the base of Belize’s Blue Hole, Cousteau and his team found out just how deceiving appearances can be. From above, the Blue Hole looks like a beautiful, pristine anomaly of nature. But on its muddy floor, a dark secret was revealed: the Blue Hole was completely covered with figures that were not easily discernible at first. 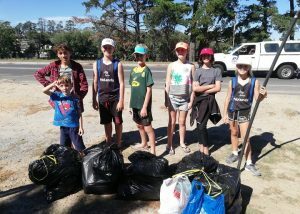 As the submarine scoured the sea bed, the team saw what they were faced with: masses of plastic pollution. Empty bottles, covered in underwater grime littered the base of the Blue Hole. Not know what they find initially, the expedition ultimately revealed yet another victim of human consumption, an underwater garbage dump. 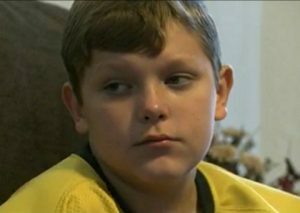 The team members were saddened and disgusted. And Sir Richard Branson knew precisely what had to be done. What had started out as an expedition to map out the Blue Hole had become a harsh reminder of the destruction that plastic had wreaked on the planet. As it turned out, there were no monsters down there at the bottom of the Blue Hole except for the ones that mankind had created: pollution. Sir Richard Branson was spurred into action. 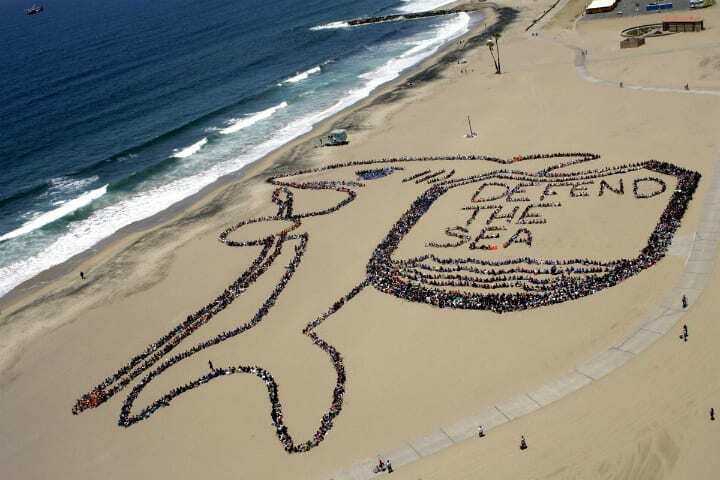 From the get-go, he had partnered the mission along with Ocean Unite, a conglomerate of conservationists from all walks of life, in order to promote awareness of the condition of the ocean. And they had a far bigger and more dramatic goal than just the Blue Hole could contain. 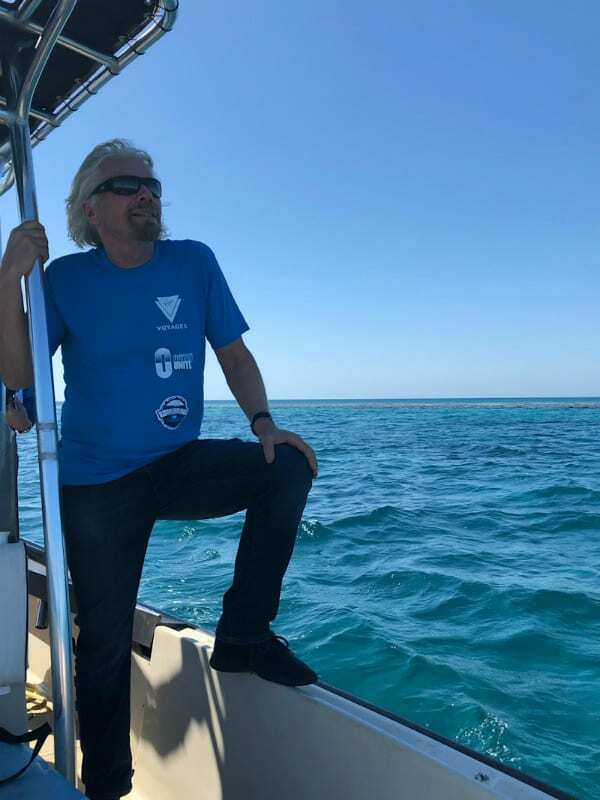 Sir Richard Branson and Ocean Unite’s goal is to set aside at bare minimum 30 percent of world oceans, to be considered a protected area with legal consequences for damaging it. They hope to achieve this goal by 2030. In order to do that, Sir Richard had to combat pollution wherever he encountered it. Upon arrival in Belize, even before the horrifying discovery in the Blue Hole, he met with the Prime Minister of Belize, Dean Barrow, and his wife. 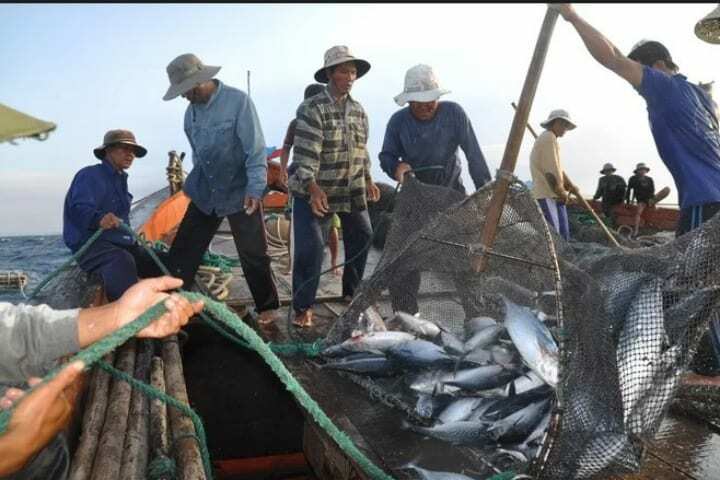 The mogul hoped to convince him to place 10 percent of Belize’s national territorial waters under protection, and to ban grill nets that damage marine ecosystems. And something big was in the works. After such a sobering discovery, the research team needed some good news. They knew that nothing happened in a nutshell, and that if action was not taken as soon as possible, the problem of discarded plastic and other human-generated waste products would surely engulf the rest of the reef, endangering the ecosystem’s survival. Thankfully, back on land, it would appear that changes were coming along quickly. 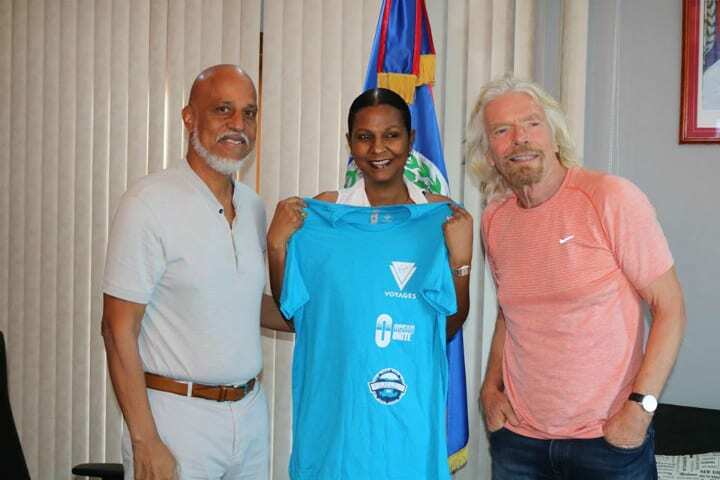 The Prime Minister of Belize was supportive of Sir Richard Branson’s proposal. 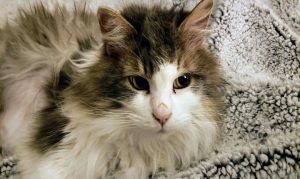 The team came out of meeting him with hopes that he would make a stirring announcement about it before the New Year. The PM’s wife is also a self-proclaimed supporter of ocean conservation. And Branson himself took a bold step. Impacted by what he had seen choking the bottom of the Blue Hole, Sir Richard Branson knew he had to take action, starting with the way he managed his own enterprises. 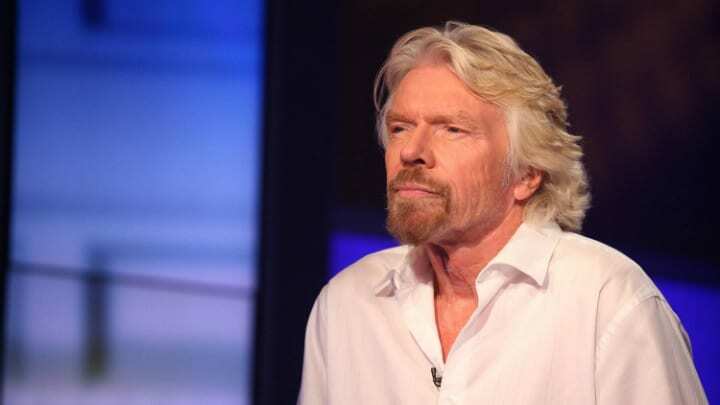 Branson’s airline companies under his supervision and leadership have now pledged themselves to cease using single-use plastic on board their flights. Branson has stated that he’s looking with grave concern toward the future, noting that his grandchildren will be in their thirties in 2050, and he can’t bear imagining them in a future without coral and other wonders the ocean contains. 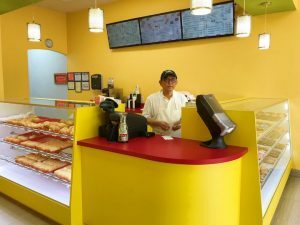 Belize has pledged to phase out single-use plastic during 2019. But this expedition to Belize was far from the first time that Branson had pledged himself to saving the environment. Sir Richard Branson has either volunteered himself as a contributing member or the founder of a substantial number of charities and NGOs related to preservation of the environment. 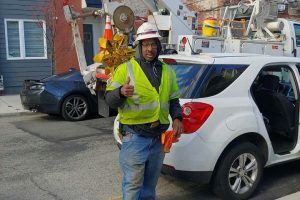 For starters, he has initiated a campaign to set aside an entire island in the Caribbean for boosting the population of the most-beloved of Madagascar’s lemur species, the endangered ring-tailed lemur. 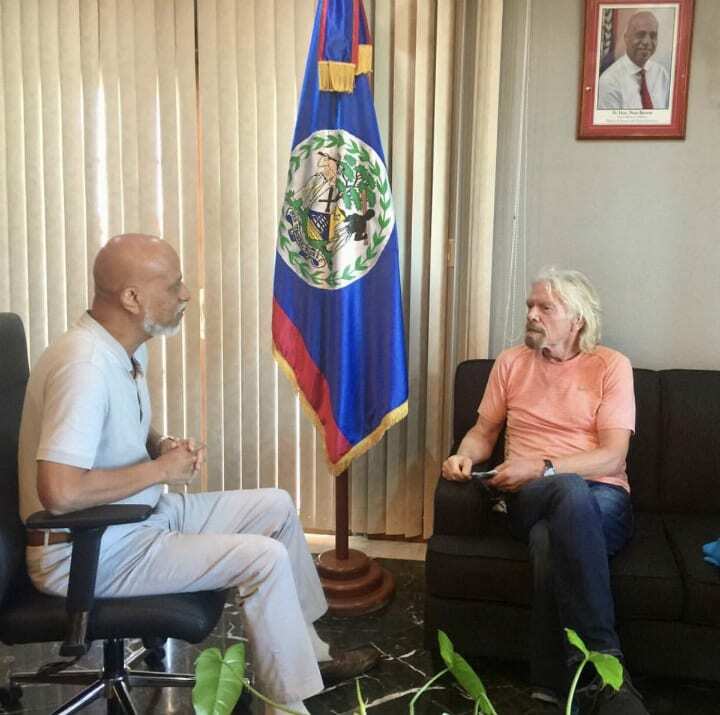 Along with the incentives he has developed for his companies to be more environmentally-friendly, such as the annual Special Award for Environment, Sir Richard also is a key member in the organization OceanElders. The group of influential artists and celebrities is devoted to raising environmental awareness with help from the likes of Neil Young and Jackson Browne to Fabien Cousteau’s own father Jean-Michel. But what are big names doing about the problem discovered in the Blue Hole? The amount of plastic waste humankind has created, as evidenced by the sobering finding at the bottom of the Blue Hole of Belize, is one of the largest environmental disasters facing the planet. Some of the world’s most beloved public figures, including Hollywood A-list actors, have pledged to join the fight. Immediately following the colossal success of his film Titanic, Leonardo DiCaprio started his namesake Leonardo DiCaprio Foundation with the express goal of aiding and strengthening organizations devoted to environmental work. One branch of his foundation is the Plastic Solutions Fund, tasked with phasing out non-essential plastic usage by 2035. 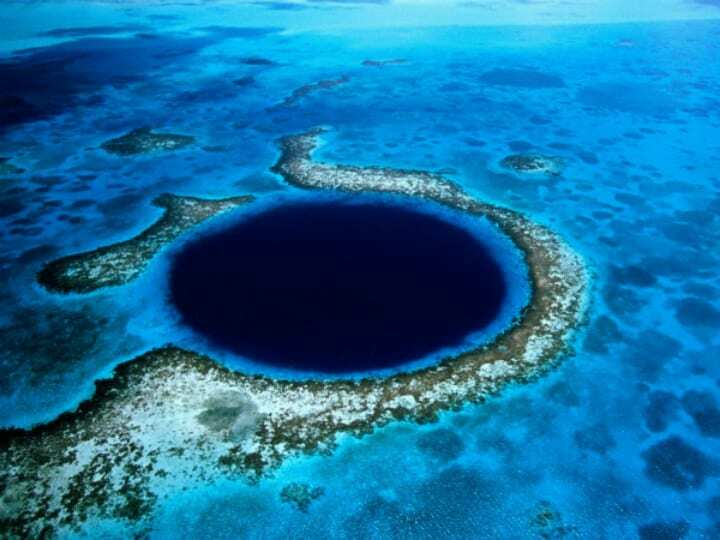 Hopefully, starpower will see to it that the Blue Hole in Belize is properly cleaned. But in Egypt, a different Blue Hole faces a doubly sinister issue. 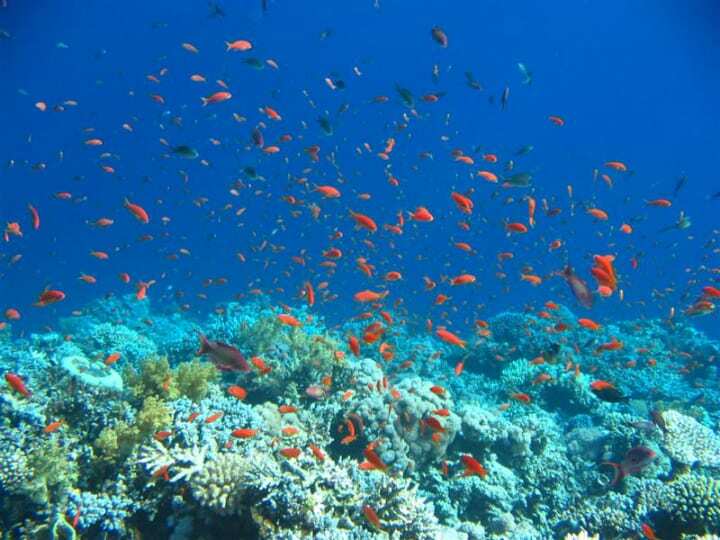 Stretching from Israel in the north to Yemen in the south, the Red Sea is the northernmost tropical sea on the planet. It is a notable hotspot of biodiversity, and vast swaths of coral reef make its waters, particularly along the Sinai Peninsula, an absolute must-visit for any diving enthusiast. 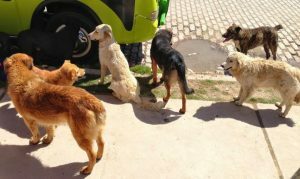 Just north of the seaside tourist paradise of Dahab, Egypt, lies one of the Red Sea region’s most famous — and notorious — natural wonders. 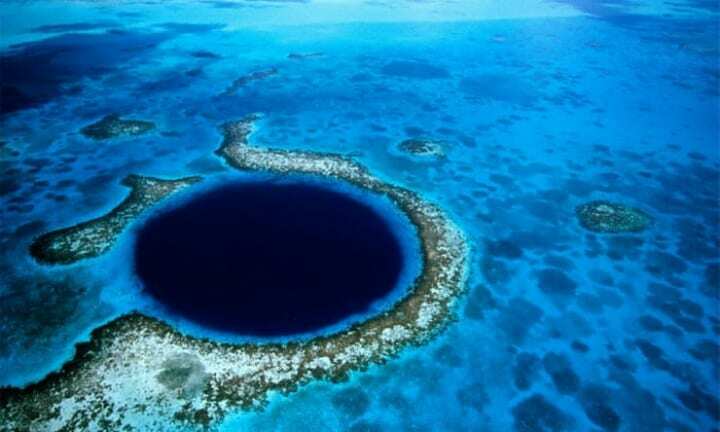 The Sinai Peninsula has its own Blue Hole, and although it is just slightly smaller than its counterpart across the globe in Belize, its eerie reputation precedes it. Unlike the Blue Hole of the Mesoamerican Barrier Reef, taking a long boat ride out from shore is not necessary in order to reach the Blue Hole of Sinai. In fact, it can be accessed quite easily from the rocky shores of the beach. But despite how close it is to land, looks can be deceiving. Situated in the middle of the coral reef, the Blue Hole presents its own drastic drop-off point before the entry to the deeper waters of open sea. And depending on what access point divers may use to enter it, the Blue Hole could potentially be his or her last swim. 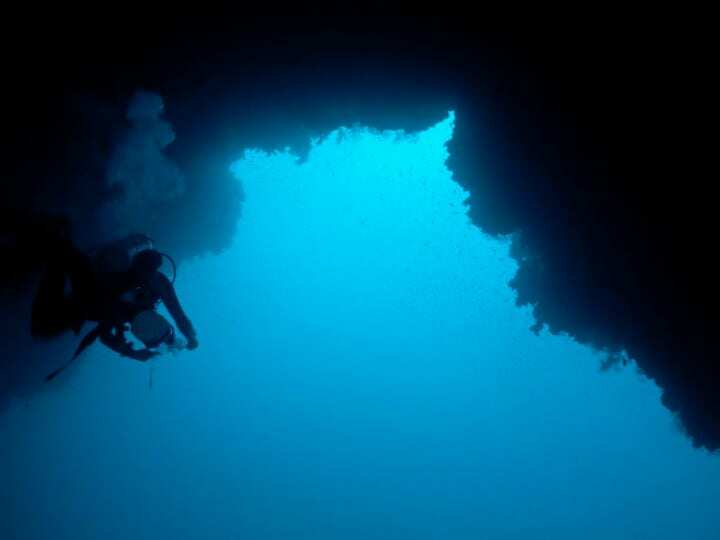 The main secret to why the Blue Hole is so notoriously dangerous lies in a structure known by professionals as “The Arch.” This is a tunnel under the coral reef that connects between the waters of the Blue Hole to the Red Sea itself, on the other side of the reef. While no proverbial monster lurks in the Blue Hole of Sinai’s depths, an invisible presence stalks and disorients divers, dragging them down to their doom. Called nitrogen narcosis, the phenomenon describes the altering effects of depth on the consciousness of the diver. The effects on a diver, no matter how prepared and experienced they may be, can be catastrophic. Because of underwater illusions and perceptions of distance along The Arch, it can appear far shorter than it actually is, further disorienting divers. 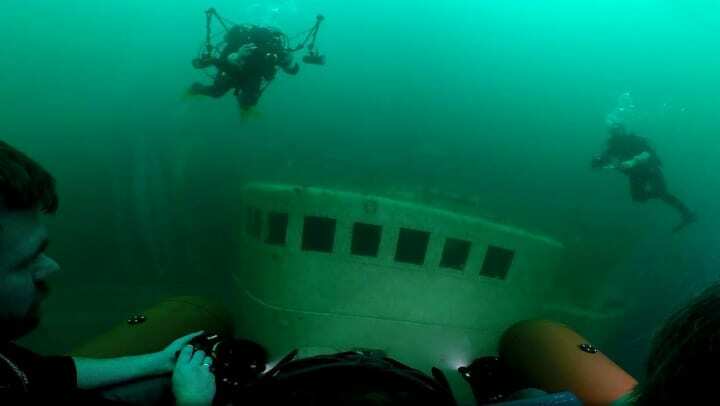 Moreover, nitrogen narcosis can cause hallucinations. Whatever the main contributing factor is, there is a reason only the most experienced divers are allowed in the Blue Hole. 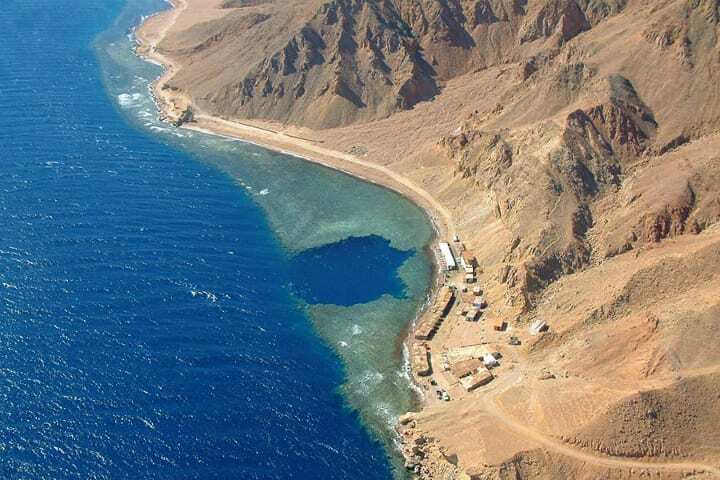 The Blue Hole in Sinai is considered possibly the most dangerous diving site in the world. Estimates run as high as 200 different people who have entered its waters and not come out alive. It remains one of the most seductively beautiful natural sites in the region, breathtaking from above, deadly from below, yet it may also be susceptible to the man-made dangers of pollutants that lurk on the nearby shores. Even the deepest point in the ocean, the Mariana Trench, is not safe from man-made plastic pollutants. Extending 36,000 feet down a very remote part of the Pacific Ocean, the Marian Trench is scourged by the hand of man with none other than plastic bags. Yes, the ones that we use at the grocery store! Despite how remote and deep this trench is, plastic has made a 36,000 feet trip and claimed its place. Scientists spotted the waste with a collection of photos and videos captured by 5,010 divers over the last three decades as part of the Deep-Sea Debris Database. Out of all the waste that the Deep-Sea Debris Database recorded over the years, plastic is the most prevalent, particularly plastic bags. Other waste materials included wood, metal, rubber, and cloth, while some waste has yet to be classified. Sadly, around 89 percent of all the plastic detected is single-use plastic like disposable utensils and water bottles. What’s more, the Mariana Trench might seem too deep, dark, and remote to accommodate life forms, but the hole actually hosts more life than you’d guess. In fact, a explorer vessel sent down the trench in 2016 recorded species like octopus, jellyfish, and even coral. But there is even more bad news. NOAA’s Okeanos Explorer discovered that marine life inhabiting the Mariana Trench are directly in harm’s way. 17 percent of the images taken of the plastic show that some of the organisms become entangled in the plastic debris resulting in suffocation and death. The pressing question is where exactly is this plastic coming from if the trench is so far removed from civilization? 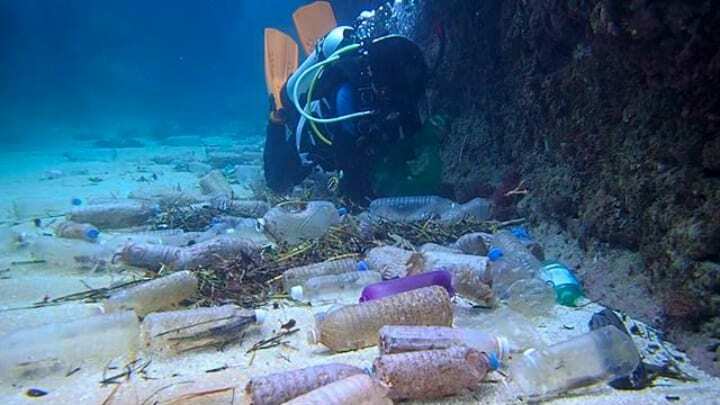 Well, it’s no secret that plastic pollution is a worldwide phenomenon, so it’s only logical that the pollution gets swept away into the depths of the oceans without breaking down, seeing that single-use plastics take hundreds of years to break down. It seems like no place on earth is immune to plastic pollution, and a new study made a startling revelation. A recent study conducted in the Mariana Trench showed that it has a higher overall level of pollution than some of the most polluted rivers in China. Now that’s a hard pill to swallow! The study also deduced that the trench may have become extremely polluted from the breakdown of the plastics in the region. 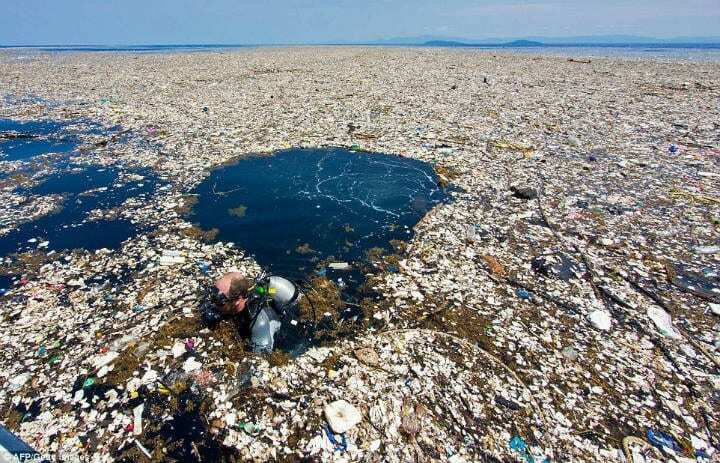 Our oceans ans seas are being fed so much plastic pollution not only because the pollutant enters the oceans directly from trash on the beach or from ships, but also from the rivers that flow directly into the sea. 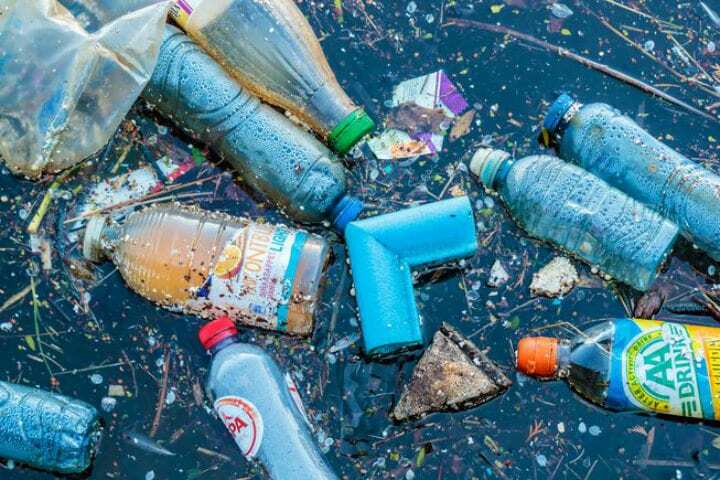 Polluted rivers that run through highly populated regions eventually make their way into the seas, so there is no way of stopping the plastic from reaching regions like Mariana Trench. 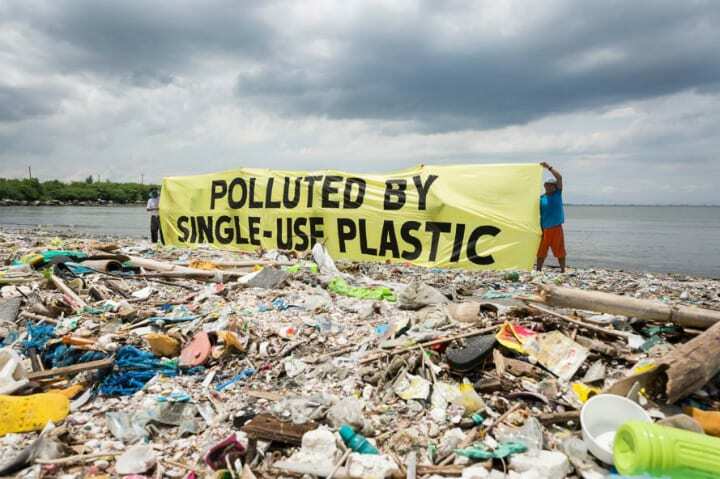 Without having to think of it too much, simple plastics discarded from ships as well as discarded fishing gear are also a major source of plastic pollution in the oceans. It’s the banal objects for humans that are wreaking havoc in the oceans and destroying the natural habitats of marine life and organisms. A study published in 2017 found that fishing gear made up the bulk of the Great Pacific Garbage Patch, which is the size of Texas, floating between California and Hawaii. This just shows how the extent of control man has over the planet, and just as quickly as we are destroying it, we can take strides to save it. Not only does plastic waste trap, suffocate, and kill marine life, it also enters their stomachs and bloodstream causing severe implications for the animals and even humans. Scientists have found that man made fibers and plastics have penetrated the stomachs of sea life, even those organisms living at the deepest depths of the ocean. The sad truth is that human waste has reached every part of the world’s oceans, even the remotest parts. 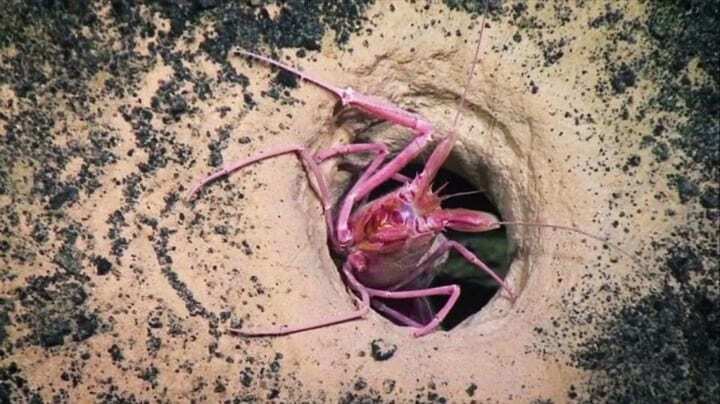 Scientists from Newcastle University conducted tests of crustaceans that inhabit the bottom of the Mariana Trench at 10, 980 meters below sea level. Each crustacean had ingested some kind of man made material, including PVA, PVC, plastics, and nylon. But how does this affect humans, you may ask. If marine life is ingesting man made plastics, it only makes sense that this plastic enters our own digestive systems after we eat fish, crustaceans, and other sea creatures. 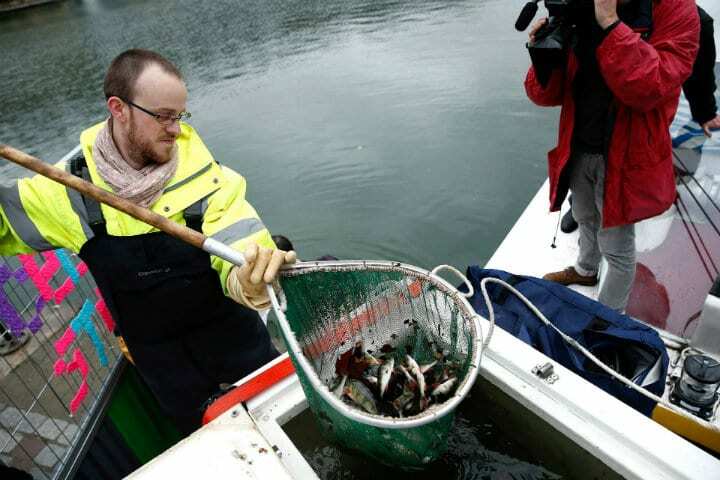 “There were instances where the fibres could actually be seen in the stomach contents as they were being removed,” marine ecology professor and the study’s lead Dr. Alan Jamieson said. Dr. Jamieson went on to say that the study’s results were “immediate and startling,” and explained how studying the most remote places on Earth just highlights how bad the situation is. Deep sea creatures eat just about anything and are very dependent on food, so if man is feeding the oceans with plastic waste, these animals will ingest them at a starting rate. Once plastic waste and litter reach the deep-sea floor, there is nowhere else for it to go, and therefore the marine life inhabiting this depths of the ocean will consume them. The amount of waste also keeps growing bigger and bigger because it cannot break down or move elsewhere. 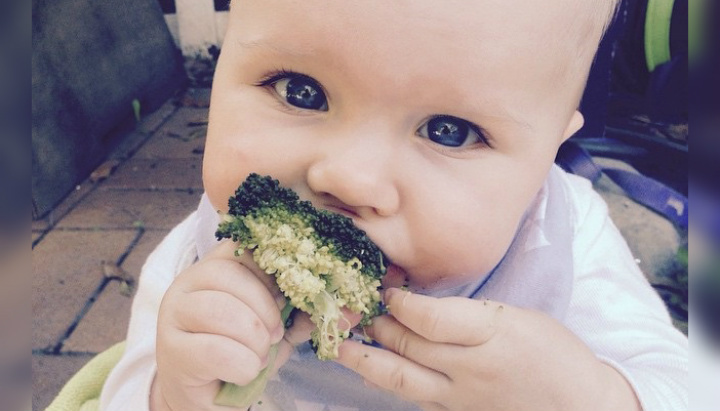 “This is a very worrying find. Isolating plastic fibres from inside animals from nearly 11km deep just shows the extent of the problem,” Dr. Jamieson said about the study’s findings. “This is global,” he emphasized. Plastic waste is everywhere: in the middle of the Pacific, in the Arctic, at the bottom of the Mariana Trench, and even inside sea animals and sea birds. It’s even in the tap water, table salt, and beer than man consumes. Studies conducted around plastic waste have deduced that over eight million tons of plastic enters the world’s oceans every single year. 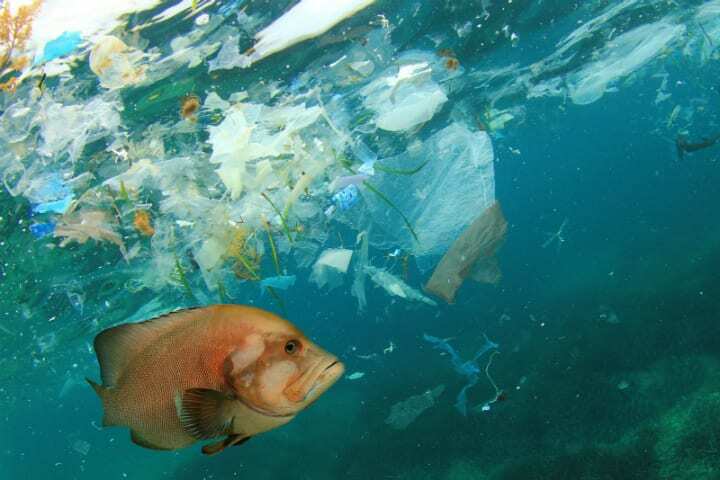 With an amount of 300 million tons of plastic littering the seas, experts have estimated that by 20150, there will be more plastic than fish. 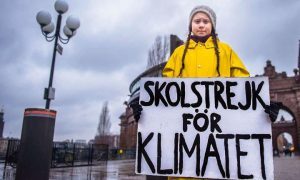 According to Elena Polisano, Oceans Campaigner for Greenpeace UK, the seas contain about 51 trillion microplastic particles, which is 500 ties more than the number of starts in our galaxy. These pollutants are gravely harming over 600 species around the world, which will most probably lead to the sixth mass extinction on Earth if we don’t act fast. The numbers and data about plastic waste don’t lie, but it is only humans who can turn these numbers around. After all, oceans are the source of all our needs, so it makes sense to take care of them. If we continue to treat the oceans like a large dump yard, then things can only get worse, but there is a silver lining.